Manchester City dropped points in epic fashion on Tuesday and Liverpool failed to take full advantage, fans would argue that four points lead got stretched to five, but deep down they knew the two points that went to the snowy night at Anfield could be the reason they won’t be champions at last. It feels like same of old stories for Liverpool, so close yet so far away, they know just how to choke when the stakes are high and they’ll take a very long time to get such opportunity again. 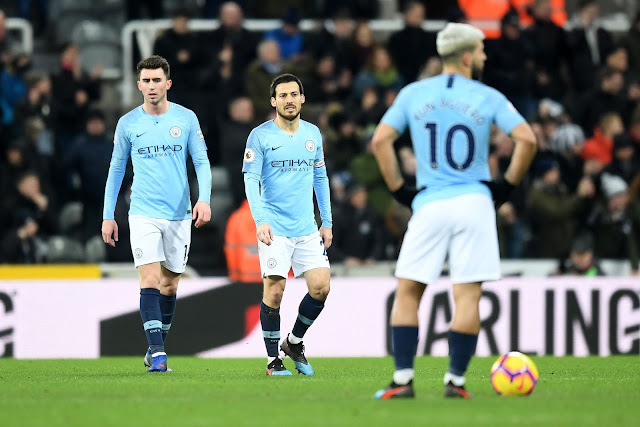 Manchester City would believe all hopes aren’t lost yet but they have to win every game to stand a chance, the Kops aren’t very reliable, they proved that again on Wednesday when they failed to put Leicester City to the sword. The Citizens won’t have laws in their own hands on this because they have played the Kops twice this season already and would need others to do them the favours but first, they must do their own business, five points gap is massive and also nothing, it depends on your attitude and your resolve. It begins for City with the Visit of Arsenal to the Emirates, forget what you heard, forget what happened at Newcastle, the champions aren’t a weak side and Fernandinho, who was the culprit for both goals on Tuesday isn’t a bad player, in fact he’s City’s most important player, his absence was the reason they couldn’t find answers against Leicester and Crystal Palace, and showing how great a side they are against an Arsenal team that is in the top four at this stage means a lot. Chelsea are in trouble, they are at the risk of missing out on top four and they really do have to get their acts right, whatever it was that they had before travelling to the Vitality stadium to get crushed mercilessly should be banished from the team forever, you don’t have so much quality in a squad and still crumble to such extent, and questions must be asked of Mauricio Sarri and his selections, why not start some youngsters? The opposition was full of young blood, the Brooks, Fraiser and Josh King that ran the Blues ragged could have been evenly matched by Ross Barkley, Loftus-Cheek and Hudson-Odoi, little wonder the latter is clamouring for a move away. The game against Huddersfield isn’t a good test but banana peels come in different shades and different colours, they gotta be careful; for the Terriers, their long journey to the championship began a long time ago, and this fixture is just there to lead them further down. Tottenham hosts Newcastle in the early kickoff of Saturday and it promises to be an explosive one, the Magpies are coming off the cloud nine they travelled to when they took the scalp of the champions but Spurs also had a day to remember at Wembley, they trailed to Watford before the intelligent Korean, Meung Son came through for them with a smashing equalizer, when they thought a point was enough. Fernando Llorente headed them in front and for the win they massively needed, now it’s up to them to show they really don’t have to crack because key men are away, but against a Newcastle side that added a record signing upfront and are willing to go the extra mile to escape the drop. Crystal Palace vs Fulham is a relegation six-pointer, so is the Burnley vs Southampton game, the two fixtures will go a long way in showing who will join Cardiff and Huddersfield in the championship next season, these are games of their respective lives… who will come to party? On Sunday, just before the match of the round at the Etihad, Manchester United will attempt to get back on winning ways when they take on Leicester, the Foxes are giant killers this season, they have beaten Chelsea, Manchester City and have held the highly rated Liverpool recently, but Manchester United under Ole Gunnar Solksjaer are the form team of the league, winning eight on the bounce before being snapped by Burnley, and it will be a good opportunity for them to bring back the winning feeling so quickly. The atmosphere in Leicester is electrifying; the confidence in Manchester is sky high, who wants it more? Here are our predictions for round 25 of the English Premier League, tricky ties everywhere but we have to do what we have to do, for some, every point matters, for some, defeat isn’t a bad thing considering the quality of the opposition, but for some, a draw is a bad result… Let’s do it!